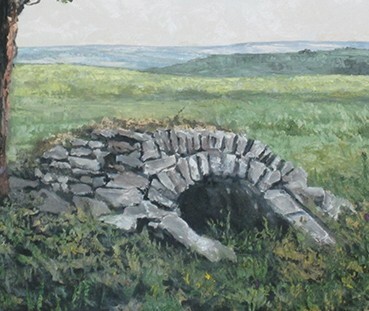 Jim Cook’s large-scale paintings of his original home, his “roots,” the Flint Hills. Tom Parish has spent several years researching and tracking down more than 300 arched-roof, man-made caves that dot the landscape of the Flint Hills, the area he has called home for most of his life. He has documented each of them and has developed techniques along the way which have enabled him to capture luminous 360-degree images of 60 of their fingerprint-like interiors. Parish describes the result as like “splitting open geodes, revealing the beauty hidden inside.” Learn more about his work documenting Kansas’ man-made caves at http://www.flinthillshelters.com and his work with the Chapman Center for Rural Studies at http://www.k-state.edu/history/chapman. We are grateful to The Volland Store Fund, SouthWind Gallery, Topeka, KS, and Alma Creamery LLC whose sponsorship has made this exhibit possible.